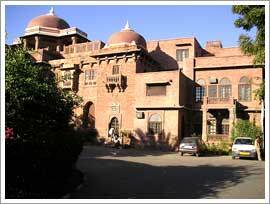 Today in Bikaner we visit Junagarh Fort, built in the year 1593 AD by Raja Rai Singh (1571-1612 AD), the 6th ruler of Bikaner. The Fort is a formidable structure & largely remained unconquered during its eventful history. It houses number of beautiful Palaces, Temples & Pavilions, which are richly decorated The beautifully maintained rooms of Anup Mahal now display the treasures of the Royal family. The Fort Museum has an extensive collection of illuminated manuscripts, jewellery, jars, carpets, weapons, treaties, decorations & Farmans (King’s Orders). Today we take an excursion to Amber Fort(11 km); the palace complex which stands to this date was commenced under the reign of Raja Man Singh. We take an Elephant ride to reach the Fort situated on the hill, an overwhelming experience.